As the school year winds down the New Brunswick Track and Field Season is in full swing. Athletics New Brunswick will host the annual provincial Middle School Championships at the Canada Games Stadium in St. John on June 2nd. There is no qualifying for this meet and it is open to any middle school aged athlete (including home schooled students) in the province. Registration is to be done online via: www.anb.ca/2016MidSchoolChamps No later than May 31th. No late entries will be accepted. The events offered are the following: 80m, 100m, 150m, 200m, 300m, 800m, 1200m,80 m hurdles, 200m hurdles, long jump, high jump, shot put and 4x100m relay . The first event starts at 10:30am. Last year’s New-Brunswick Middle School Championships also took place at the Canada Games Stadium in Saint John. Unfortunately, due to extreme weather conditions, all of the events in the afternoon were cancelled. This year’s weather looks promising with the forecast calling for 15 degrees under sunny St John skies. Excellent performances from Devon Middle School helped them win the 2015 provincial championship in the two categories, male and female. Male athletes of this school leave with the provincial banner for a second consecutive year. Athletics New Brunswick is very pleased to announce that it's ever popular 12 Challenges program will be returning to Miramichi! The program will take place at the James M. Hill Track Wednesdays from 6:00pm to 7:00pm beginning June 8 and continuing June 15, July 6, and July 13th. Three different track and field events are scheduled each week, resulting in the completion of 12 events total (hence the name of the program). Leaders at each location are trained Run Jump Throw Wheel instructors, including some of the province's finest track and field athletes. Interested participants are asked to sign up as soon as possible as there are limited spaces. Due to the ever-increasing popularity of the program, spots do fill up quick, so register early to avoid disappointment. Please note that registration closes at 11:59pm on June 5. There will also be registration on site starting at 5:30pm Wednesday June 8 before the first session. More information about the program can be found at: https://www.anb.ca/Programs/12-defis-challenges.php. In addition to the 12 challenges series there will be a Run Jump Throw Regional meet held Wednesday June 29th at a cost of $5.00. Participation in this meet is a requirement to attend the Run Jump Throw provincials, held in Moncton on July 9th. More information to follow. This past Saturday over 600 New Brunswick high school track and field athletes competed in their respective regional meets in hopes of securing a spot at the provincial championships set for Saturday, June 4th at the Moncton 2010 Stadium on the Université de Moncton campus. Qualification regionals determined the athletes, top 8 in each event from each region, who will advance to this weekend’s provincial championships. Competitors in all field events were required to jump a qualifying height in order to advance. Both regional meets saw athletes face windy conditions with periods of low temperatures, ideal for distance running but not many other events. Based on this year’s regional results, there exists the potential for exciting competition as well as the possibility of new NBIAA provincial records being established. - The noon 100m face-off between Jack Berkshire, Fredericton High School and Tyrell Martin of Dalhousie Regional High will be center stage next weekend. Jack Berkshire also ran a fast 200m and 400m and will be an athlete to watch next weekend, with a chance of pulling off wins in all three of his events. - The senior girls 100m will also prove to be an exciting competition between Canterbury’s Samantha Taylor and École L'Odyssée’s Veronique Omalaosan. - Clint Steeves of JMA placed first in senior male long jump, 110m Hurdles and 400m hurdles. Clint will be looking to better his own provincial 110m hurdle record this weekend. - Hannah Trites of Fredericton High School ran an impressive times in the junior female 800m and 1500m, pulling off wins with times of 2:20.86 and 1500m, respectively. - The 1500m senior female race will be one to watch between Miramichi Valley High School’s Laura Dickinson, who ran 5:02.68 in Rexton, and Hannah Cormier of Fredericton High, who ran 4:59.97 in Saint John. At last year’s championships, Dickinson broke the NBIAA record in the junior category with a time of 4:43.31 and will now target the senior record of 4:36.13. - Lars Schwarz of Ecole Sainte-Anne ran well in both the junior male 1500m and 3000m race, battling Leo Hayes’ Micthel Kean. Kean took the win in the 1500m while Schwarz took the win in the 3000m. - The junior female triple jump competition results included impressive distances from Magkeda Mekkonen of Ecole L’Odyssee at 10.07 m and Lexie Shannon of Leo Hayes High School at 10.73 m. Both athletes will look to better the existing NBIAA record of 9.83 m set by Brianna Forbes in 2015. - In the junior male triple jump, Alex Cormier of École Mgr-Marcel-François-Richard jumped 11.62m placing him in good standing to break the junior boys’ NBIAA record of 11.53m set by Clint Steeves in 2014. - Jillian Beck of Harbour View High School threw an impressive 33m in the junior female javelin. - Melissa Pellerin’s javelin throw of 40.87m in Rexton shows that she is on pace to break Lindsay Gauvin’s senior female record of 40.89m set in 2010. - In the senior female discus, Sara Eve Noel threw a distance of 36.35 and will be looking to best her own record of 39.54 this upcoming weekend. Take the opportunity to come out and enjoy this world class Moncton facilit, as New Brunswick’s best high school track and field athletes look to compete for personal bests and provincial records. May 28 2016 - Genevieve Lalonde Breaks National Record! Genevieve Lalonde of Moncton has always been a storm to reckon with since her first days in the sport, and in recent years has made a name as one of the fastest in the nation's history. Today, at the Prefontaine Classic in Oregon, Lalonde ran a time of 9:32.17 to smash the Canadian record and become the fastest ever Canadian in the event. The Prefontaine Classic, an IAAF Diamond League meeting, atracts some of the biggest names in the world including World and Olympic medalists, and even world record holders. The race went out fast with Ruth Jebet Bahrain winning with a time of 8:59.97, the second fastest time ever and just more than a second off the world record. Coming in just behind her was Kenya's Hyvin Kiyeng with a time of 9:00.01, the third fastest time ever. Emma Coburn of the United States took third in a time of 9:10.76, while Genvieve Lalonde finished 10th overall with a time of 9:32.17. The former Canadian record was held by Jessica Furlan of Saskatchewan with a time of 9:33.45, set in 2014. Perhaps the most exciting conclusion to the race was the number of national records set. Ruth Jebet broke the Bahrainian record, Hyvin Kiyeng broke the Kenyan record, Emma Coburn broke the American record, and Genevieve Lalonde broke the Canadian record. Also of noting is that Genevieve managed to beat both Ashley Higginson and Shalaya Kipp, both of the United States, who had won gold and silver, respectively, at the Pan American Games last year, while Lalonde won bronze at that event. "Genevieve has been at the top of the game for years now, and with a breakthrough season last year this record comes with little surprise, but with much excitement," said Gabriel LeBlanc, Technical Director of Athletics New Brunswick. "This time solidifies Gen as the fastest in Canadian history and is a phenomenal step on her way towards making the Olympic Games this summer." This national record is not Lalonde's first, as she also held the national record in the 2000m steeplechase, set while winning gold at the Canada Games in 2013, and in the junior 3000m steeplechase 9:57.74, set while placing 6th at IAAF World Junior Championships held in Moncton in 2010. Her junior 3000m steeplechase record also serves as the North American junior record. One of New Brunswick greatest athletes has announced his retirement. Caleb Jones of Saint John has enjoyed an extraordinary career in the world of track and field since beginning the sport, but has chosen to leave his competitive career on a high note. Jones has been a champion at every level of the sport in Canada, winning gold medals at the Canadian Legion Youth Track & Field Championships in 2008, the Canadian Junior Track & Field Championships in 2010, the Canada Games in 2013, and the Canadian Track & Field Championships in 2015. Caleb has also won many gold medals at New Brunswick Championships, Atlantic Championships, and at the New Brunswick High School Championships where his record has not come close to falling. In 2010, Caleb threw the javelin 69.68m to win the Canadian Junior Track & Field Championships and earn his spot on Team Canada for the IAAF World Junior Track & Field Championships taking place in Moncton. Caleb's throw was also good enough to smash the championship record, then held by Scott Russell, Canadian record holder in the event and a 10th place finisher at the 2008 Summer Olympics. At the World Junior Championships in Moncton, Caleb threw 69.36 to qualify for the finals where he threw 69.77 to finish 10th overall and as the top Canadian. In his career as a senior athlete, Caleb won the gold medal in the javelin at the 2013 Canada Games in Sherbooke, and just a month later finished 5th at Jeux de la Francophonie in Nice, France. Recent years has seen trips to Finland to train and compete with many of the best javelin throwers and coaches in the world. In 2015 Caleb narrowly missed out on making Team Canada for the Pan American Games, but earned redemption as he won a gold medal at the Canadian Track & Field Championships, then the only national championship he had yet to win a gold medal at. Caleb retires from the sport with provincial records in the javelin, in the youth, junior, and senior category. Although never an easy decision, Caleb, with the guidance from his coach Dr. Earl Church, has decided that the best long term decision is to bring his career to a close as a result of chronic injuries. Jones is now planning a full-time transition into the art world, expanding his role as Manager of Jones Gallery and Studio, a Saint John-based business founded by his sister, Sarah Jones, in 2010. Caleb has stated his deep appreciation for all those who helped fuel his outstanding career in the sport and to the many loyal fans spanning all across the province. "Caleb's retirement is certainly very sad news for out sport, but it is also the time to look back on a phenomenal career that last a decade," said Gabriel LeBlanc, Technical Director of Athletics New Brunswick. "Caleb ends his career as one of the most decorated and successful athletes in our sport's history, a champion at many levels in the sport and a strong competitor on the international stage." Over the past six months Athletics New Brunswick has worked hard at increasing the number of coaching education events and opportunities offered. The association believes that the strength of the sport starts with educated and qualified coaches across the province. Since November of 2015 a total of 127 individuals have taken part in a National Coaching Certification Program (NCCP) coaching education event offered by Athletics New Brunswick or as members of ANB took part in an event offered by a partner organization. “Coaches are the heart of all youth sports and ANB is very proud of all of our coaches. We see huge benefit in supporting the NCCP and coaching education as a whole,” said coaching education director Jason Reindl. Much of this success can be attributed to the Director of Run-Jump-Throw-Wheel, Alex Holder, who joined ANB back in October 2015. Alex has done a great job in terms of getting around the province to deliver workshops in Saint John, Moncton, Fredericton, Bathurst, and is continually looking at new communities to bring RJTW to. New Brunswick athletes were in action on Saturday at the Battle Road Track Club's Twilight Meet #1 in Boston, Massachusetts, with many athletes achieving personal bests in their events. - Samantha Taylor of Canterbury finished 3rd in the 100m with a time of 12.67 and 1st in the 200m with a time of 26.46. - Robyn Davis of Fredericton finished 18th in the 800m with a time of 2:24.53. - Chelsey Hall of Upper Kingsclear finished 23rd in the 800m with a time of 2:27.25. - Grace Annear of Hampton finished 4th in the 800m with a time of 2:05.70. Annear’s time was just half a second off her own provincial record and her fastest ever opening race. - Jack Berkshire of Fredericton finished 4th in the 400m with a time of 49.76. - Matthew Butler of Fredericton finished 36th in the 800m with a time of 2:05.15. - Michael Colford of New Maryland finished 36th in the 1500m with a time of 4:11.04. - Victoria LeBlanc of Saint John 2nd in both the 200m and 400m with times of 27.29 and 60.78, respectively. - Artabaz Nazari of Saint John finished 5th in the 100m with a time of 11.38 and 4th in the 200m with a time of 23.97. - Dan Brown of Hampton finished 6th in the 400m with a time of 50.58 and 35th in the 800m with a time of 2:03.88. - Josh Shanks of Chance Harbour finished 22nd in the 5000m with a time of 15:46.08. - Hannah Cormier of Fredericton finished 11th in the 1500m with a time of 4:56.41. - Hannah Trites of Fredericton finished 10th in the 3000m with a time of 10:55.06. Athletics New Brunswick is seeking applications from interested students for 3 Run Jump Throw Wheel Coordinator positions (Bathurst area and Kennebecasis Valley area). The successful candidate will be expected to assit in training and administrative activities. Potential candidates: need to be 15 years or older, and returning to studies in the fall. This position is ideal for individuals who are proactive and able to work independently. Their contribution is key to the continued expansion of Track and Field throughout New Brunswick. This is an 8 week, 30 hours per week position paying $12.00 an hour. These positions are funded via Service Canada and will begin late May. Applicants are asked to forward their resume to alex.holder@anb.ca by Thursday, May 19, 2016. Please clearly indicate which position (area) you are interested in. ANB has several RJTW Coordinator Positions (Fredericton, Moncton, Saint John, Kennebecasis Valley) availalable through this program including a position for U22 Eastern Espoir Championships Coordinator. Please visit the SEED Job Bank to apply for these positions. If you have any questions, please contact alex.holder@anb.ca for clarification. Athletics New Brunswick is pleased to be hosting the Atlantic Throws Summit, taking place May 14th - 15th in Moncton. All technical and practice sessions of the event will take place at the Moncton Throwing Complex next to Moncton Stadium while classroom sessions and coaches round table sessions will take place in the CEPS, also next to Moncton Stadium. - Richard Parkinson, Throws Coach at York University and personal coach of Brittany Crew, gold medalist in both the shot put and weight throw at the 2016 CIS Track and Field Championships, bronze medalist at the 2015 Summer Universiade and currently ranked #2 in Canada for the shot put event. Richard has an enormous amount of experience in the throwing events, having coached multiple national team athletes and having been a national team member himself. Richard has coached 5 Canadian Junior Champions, several OFSSA Champions, and one NCAA Champion. - Jonathan Doucette, Manager of Coaching and Technical Development at Athletics Nova Scotia and former CIS gold medalist in the shot put. Jonathan is the throws coach at Halifast Athletics and has been a coach for multiple CIS medalists in both the shot put and the weight throw, and has been a coach for multiple national teams. - Dr. Earl Church. An inductee into the Canadian Paralympic Hall of Fame and The Canadian Cerebral Palsy Sports Association Hall of Fame, Dr. Earl Church is one of the most well known paralympic throws coaches in the nation, having coached at multiple Paralympic Games and World Championships, with many of the athletes he has coached winning medals at the events. Church is also the personal coach of javelin thrower Caleb Jones, reigning Canadian Champion, Canada Games gold medalist, and a member of Team Canada in 2010. - Aaron LeBlanc, 2013 Canada Games team member, New Brunswick record holder in the youth weight throw, and silver medalist in the weight throw at the 2013 AUS Track and Field Championships. Aaron will be leading a clinic for youth development at the event, covering shot put, discus, and javelin. The throws technical modules of NCCP Performance Coach will also be offered to coaches at the event, led by facilitator Steve LeBlanc. Costs for coaches and athletes are $25 for the first day of the event, or $35 for the full weekend. The cost for coaches wishing to take the NCCP modules is $50. "This is an excellent opportunity for the region's throwers to learn from some of Canada's best coaches, and comes just in time for the beginning of the outdoor season," said Gabriel LeBlanc, Technical Director of Athletics New Brunswick. "The NCCP technical modules being offered are also an excellent educational opportunity for coaches." Athletics New Brunswick is very pleased to announce that it's ever popular 12 Challenges program will be returning for 2016, and will be expanding to include a location in Rothesay! The program has been run in a few surrounding areas such as Hampton and Saint John in years past, and due to it's popularity, the 12 Challenges will expand and take place at the Rothesay Common. The program will take place from 6:00pm to 7:15pm on May 31st, June 7th, 14th and 21st. Three different track and field events are scheduled each week, resulting in the completion of 12 events total (hence the name of the program). Instructors at each location are trained Run Jump Throw Wheel instructors, including some of the province's finest track and field athletes. "The 12 Challenges program is one of the nation's greatest introductory programs to track and field and we're incredibly happy to have it back," said Gabriel LeBlanc, Technical Director of Athletics New Brunswick. "We are thrilled to be offering the program in Rothesay and we hope to reach even more children there and introduce them to this wonderful sport." Interested participants are asked to sign up as soon as possible as there are limited spaces. Due to the ever-increasing popularity of the program, spots do fill up quick, so register early to avoid disappointment. Please note that registration closes at 11:59pm on May 26th unless spaces are all filled up before then. The Fredericton Marathon Committee is excited about the upcoming Youth Fun Run sponsored by Run New Brunswick in conjunction with The New Brunswick Medical Society and Trites Orthodontics. 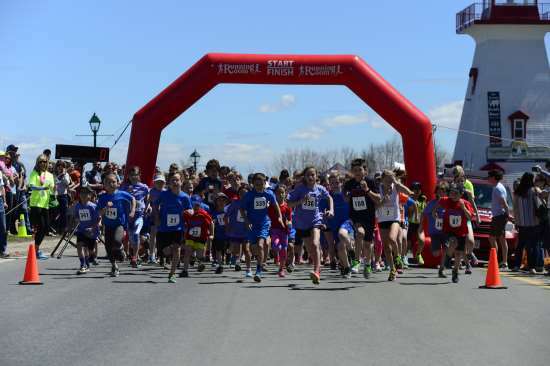 The 1k and 3k run will take place on Pointe Sainte Anne’s Drive on Saturday, May 7 at 2:00. Registration is at the Fredericton Convention Centre from 12:00-1:30. It is $2 and all participants will receive a mini marathoner t-shirt, a race bib and medal. There will be post run refreshments on the deck of the Lighthouse. Athletics New Brunswick will be there hosting a Run, Jump, Throw, Wheel demo during this event. It should be great fun so we encourage all youth 14 years and under to come along and join in this fabulous event! For more information, to contact Gabriel LeBlanc at anb@anb.ca or (506) 869-1038. This summer Atheltics New Brusnwick is looking for Run Jump Throw Wheel (RJTW) Coordinators to deliver programming, provide help with track meets and coordinate the RJTW Series, etc. Positions will be available in Fredericton, Moncton, Saint John, Miramichi, Bathurst and in Kennebecasis Valley. We are also looking for a U22 Eastern Espoir Championships Coordinator to work with our Technical Director in coordinating all things relating to the championships. For one of Canada's best ever steeplechase runners the season has just begun, but eyes are already looking towards a new Canadian record and a spot on Team Canada for the Rio Olympics. Genevieve Lalonde of Moncton competed at the Payton Jordan Invitational in Palo Alto, California placing 2nd in the 3000m steepelchase. Lalonde finished the race in a time of 9:38.88, her third fastest time ever and just 5 seconds off the national record. This time is the fastest among Canadians this year, and puts Gen as the 7th fastest in the world so far this year. The time also qualifies Gen with the A+ standard for Team New Brunswick at the 2017 Jeux de la Francophonie, taking place in Côte d’Ivoire. The race was won by last year's NCAA Championships runner-up Courtney Frerichs with a time of 9:29.31, while 2012 Olympian Shalaya Kipp was 3rd with a time of 9:43.72. Frerichs' time is the 5th fastest time in NCAA history. With such a strong season already underway, Gen has been invited to compete at the prestigious Prefontaine Classic, an IAAF Diamond League meet. Gen will race the 3000m steeplechase at the meet, taking place May 27th and 28th in Eugene, Oregon. The Prefontaine Classic has become one of the most recognized meets in the world and has featured many of the world's top performances in history including a number of world records. "It is great to see such a strong season opener for Gen at the Payton Jordan Invitational," said Gabriel LeBlanc, Technical Director of Athletics New Brunswick. "This result certainly puts Gen in an excellent position to make Team Canada for the Rio Olympics this summer, and to take aim at the Canadian record."